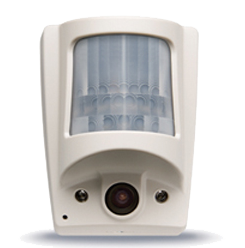 The Videofied® Video Alarm System marks a real turning point in the alarm systems market. Immediate installation without wires or power, it gives the central station monitoring operator actual video of the intrusion. This video verifies that the alarm is an actual crime-in-progress and not a false alarm. The Motionviewer™ monitoring device is a sophisticated passive infrared sensor combined with a night vision camera. On detecting motion the wide-angle camera records a 10 second video. The video is sent to the monitoring station over a GPRS mobile signal. In cases of intrusion or real danger the monitoring station can call the police. This is NOT a surveillance system: we separate security from surveillance to protect privacy. With videofied , no one can ‘look in’ remotely unless the camera has been activated by the alarm system. Video alarms are only sent when the alarm panel calls the monitoring station during an intrusion.